Mr Christmas' 2003 Nottingham Fair Roundabout BRAND NEW Modeled after an antique English carousel, figures go up and down while 15 Christmas carols and 15 all time classic play. Hand Painted Carousel Figurines - Figurines Move up and down and in circular motion - Figurines are lit by canopy and mirrored lighting - Choice of Christmas Carols or All Time favorites - Excellent and a Cherished piece for any Collection Nottingham Fair Roundabout As the Carousel turns and plays songs, eight beautifully painted animals that slide up and down on decorative golden rods in time to the music. Very nice detail on the animals. 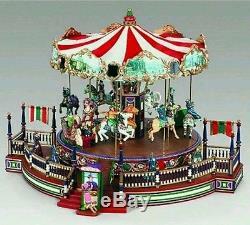 Inside the carousel are mirrors with lights that reflect the animals in motion as they rotate. Wonderful piece to display during the Holidays and throughout the year. 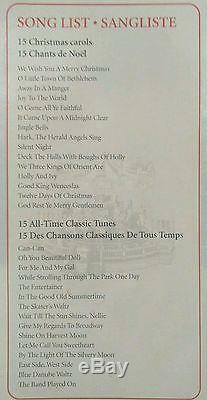 Choose between 15 Christmas Carols and 15 All Time Classic Tunes. CHRISTMAS CAROLS: -- We Wish You A Merry Christmas -- O Little Town of Bethlehem -- Away In A Manger -- Joy To The World -- O Come All Ye Faithful -- It Came Upon A Midnight Clear -- Jingle Bells -- Hark The Herald Angels Sing -- Silent Night -- Deck The Halls -- We Three Kings Of Orient Are -- Holly And Ivy -- Good King Wenceslas -- Twelve Days Of Christmas -- God Rest Ye Merry Gentlemen ALL TIME CLASSICS: -- Can-Can -- O You Beautiful Doll -- For Me And My Gal -- While Strolling Through The Park -- The Entertainer -- In The Good Old Summer Time -- Skaters Waltz -- Wait Til The Sun Shines Nellie -- Give My Regards To Broadway -- Shine On Harvest Moon -- Let Me Call You Sweetheart -- By The Light Of The Silvery Moon -- East Side -- West Side -- Blue Danube -- The Band Played On. 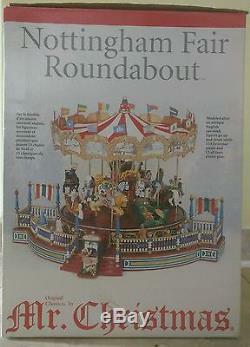 Christmas 2003'Nottingham Fair Roundabout' Musical Carousel #19842 NEW" is in sale since Saturday, December 24, 2016. This item is in the category "Collectibles\Holiday & Seasonal\Christmas\ Current (1991-Now)\Other Current Christmas Décor". The seller is "vinyl-lush" and is located in Oxnard, California. This item can be shipped to United States, to Canada, to United Kingdom, DK, RO, SK, BG, CZ, FI, HU, LV, LT, MT, EE, to Australia, GR, PT, CY, SI, to Japan, to China, SE, KR, ID, to Taiwan, ZA, TH, to Belgium, to France, to Hong Kong, to Ireland, to Netherlands, PL, to Spain, to Italy, to Germany, to Austria, RU, IL, to Mexico, to New Zealand, PH, SG, to Switzerland, NO, SA, UA, AE, QA, KW, BH, HR, MY, BR, CL, CO, CR, PA, TT, GT, HN, JM.